Could Climate Change Unleash a “Giant Virus” On the World? The Siberian tundra is full of all kinds of unique surprises, as recently proven by researchers Jean-Michel Claverie and Chantal Abergel, who were able to extract a new type of “giant virus” from the permafrost. Called Pithovirus ciborium, this new virus is among the largest and most complex viruses ever studied. 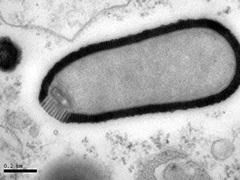 The scientists claim that the new Pithovirus is 1.5 microns long and 0.5 microns across, and is made up of 500 genes. To put that into perspective, the HIV virus has only 12 genes. Part of the reason this giant virus is making headlines is because although it was stuck in ice for 30,000 years, the researchers exposed it to amoebas and discovered that the Pithovirus actively attacked the specimen. The amoebas are used as “bait” for the virus in order to contain it, as well as to determine that the virus is innocuous to humans or animals. The study of giant viruses has grown significantly over the last few years, as two other groups of viruses, Mimivirus and Pandora virus (the latter also excavated by Claverie and Abergel), have been discovered during that time. While it is an exciting time for researchers in the field, these discoveries raise a growing concern that a virus buried in the ice and inactive for centuries could be unwittingly unleashed upon the world, especially with climate change melting large portions of arctic ice. Luckily, a professor of microbiology at Emory, Edward Mocarski, claims the odds of locating a human pathogen in the ice are about as small as viruses themselves. “It is extremely unlikely unless the virus came from a frozen human being who possibly died from a virus that is no longer in circulation,” said Mocarski. Despite the odds, Claverie and Abergel feel that the scenario is still possible, and as a result, will continue to exercise caution in future field studies. Posted on March 12th under Global Ecology.